The weather here in Maine is finally changing the snow is gone, the weather is warming up and the spring flowers are beginning to bloom. Today my post is using one of Susan’s Garden new dies which will be available soon from Elizabeth Craft Designs. 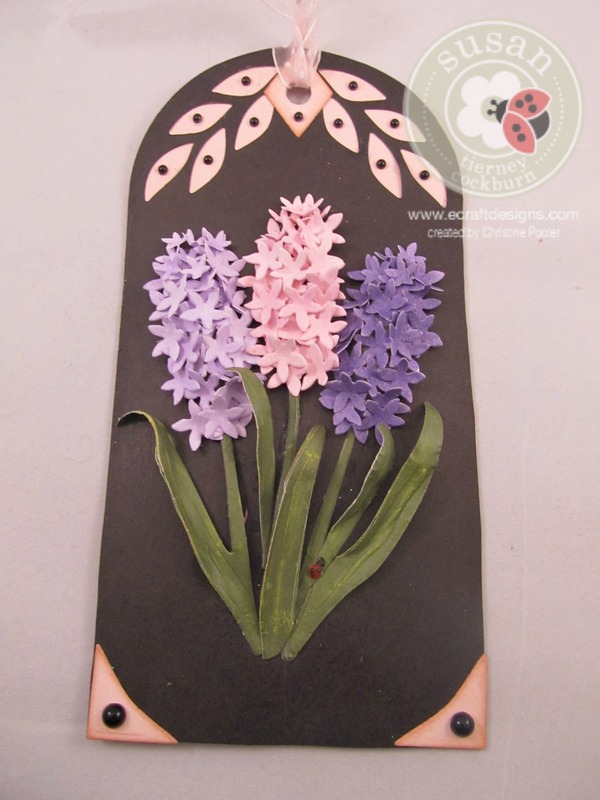 I have used the Hyacinth die and the Elizabeth Craft Designs Tags & More 3 – Leaves die set. 1. Using the Tags & More 3 – Leaves die set and a piece of black cardstock and a piece of pink cardstock 3-1/4 X 6-1/2 cut the top of your tag and the base tag see video here . Cut the corner pieces and the diamond piece from pink cardstock. Ink all edges (I used Distress Ink – vintage photo). Attach the 2 corner pieces to the bottom corners and the diamond shape at the top lining up the hole. 2. Using 3 pieces of white cardstock and Pan Pastels Permanent Red Tint, Violet and Violet Tint take a sponge and color each piece of white cardstock with one color of the Pan Pastels. (I actually colored both sides of the cardstock and of course if you do not have Pan Pastels you can use colored cardstock). Cut petals from each color 2-3 times. Put the little flowers on the mini molding pad and shape using the medium ball tool from Susan’s Garden 4 pc tool kit. Cut the stem and leave from green cardstock place on leaf mat (coming soon at Elizabeth Craft Designs) and shape them using the leaf tool from the tool kit. I cut the stem twice shaped the top one and glued the 2 together to make it a little more dimensional. Using the Bright Yellow green Pan Pastels add a little shading to the leaves. I did cut the big leaf off from 1 of them and I reversed the direction of one of them so they would fit. Attach stems to tag and then build your flowers on the stems. Attach the large leaf that you cut off and a couple of other leaves. 3. Attach small black pearls in the middle of each leaf cutout at the top and a little larger one in the middle of each corner. 4. Add a pc of ribbon to the hole at the top of the tag. I do hope that you will visit Elizabeth Craft Designs website and see all the new items that are coming soon Susan’s Garden alone has 13 new die sets.